" Yes sir. In the Pacific we bypassed them. We closed in. 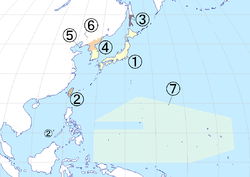 You must understand that Japan had an enormous population of nearly 80 million people, crowded into 4 islands. It was about half a farm population. The other half was engaged in industry. Potentially the labor pool in Japan, both in quantity and quality, is as good as anything that I have ever known. Some place down the line they have discovered what you might call the dignity of labor, that men are happier when they are working and constructing than when they are idling. This enormous capacity for work meant that they had to have something to work on. They built the factories, they had the labor, but they didn't have the basic materials. There is practically nothing indigenous to Japan except the silkworm. They lack cotton, they lack wool, they lack petroleum products, they lack tin, they lack rubber, they lack a great many other things, all which was in the Asiatic basin. 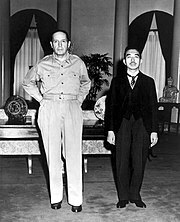 They feared that if those supplies were cut off, there would be 10 to 12 million people unoccupied in Japan. 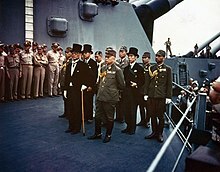 Their purpose, therefore, in going to war was largely dictated by security.（後略）"
^ 宮崎繁樹. 法律論叢　占領に關する一考察. 明治大学法律研究所. pp. 116-132. ^ 伊藤正直 『戦後日本の対外金融』 名古屋大学出版会 2009年 p.72.